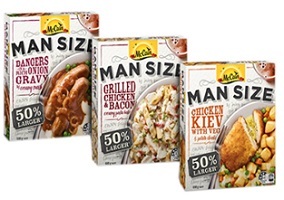 International frozen food giant McCain has launched a range of ‘man size’ frozen meals in Australia that are claimed to be better quality, more satisfying, and larger than traditional products. According to Inside FMCG, McCain Man Size Ready Meals are claimed to be 50% larger than regular frozen meals, and made with “quality cuts of meat” and “hearty sides”. Despite the “Man Size” name, the range is said to be targeted not just at men, but at any consumer looking for larger meals with better flavour and high quality ingredients. “In a time where more Australians are becoming time-poor and crave a satisfying dinner within minutes at home, we saw the need to create frozen meals that are hearty, while offering convenience and value for money”, said McCain Foods ANZ product manager Rebecca De Xavier Pinto. The meals available are Bangers in a Rich Onion Gravy with Creamy Potato Mash, Grilled Chicken & Bacon Creamy Pasta Bake and Chicken Kiev with Vegetables & Potato, sold in packs ranging from 480g to 500g for an RRP of A$7.99 ($6.32).